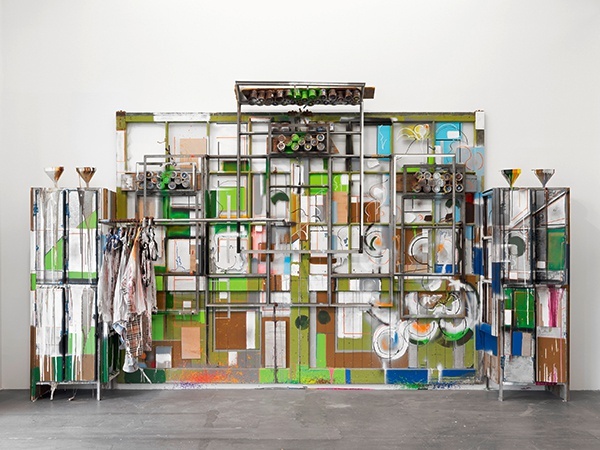 First conceived by Dieter Roth in the early 1980s, “the bar” is a dynamic and changing installation, and is a continuing element in the Roths’ cross-generational practice. As a condition for him to exhibit with Hauser & Wirth, Dieter Roth insisted that a bar form part of his first show in 1997. Along with his son Björn, Dieter Roth installed the functional ‘Bar 2′ (1983 – 1997) around the corner from the gallery in Fabrikstrasse in Zurich. Every beer bottle served became a part of the bar installation and visitors’ conversations were recorded and archived. Nearly 20 years after this event, another bar—entitled “Roth Bar”—will now inhabit the gallery, bringing reality and art even closer together. 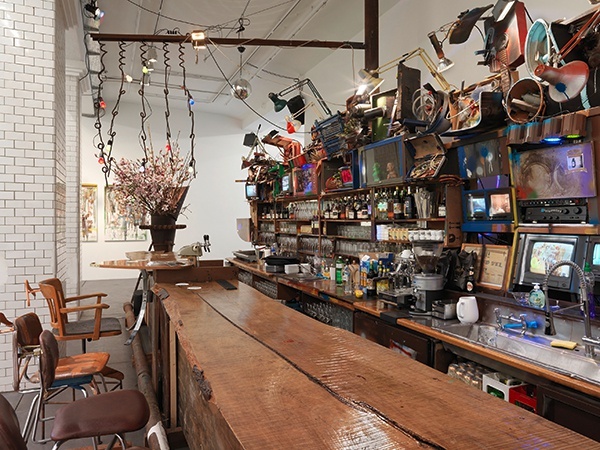 The bar, comprised of scavenged materials, embodies a central motif found throughout Dieter Roth’s work. 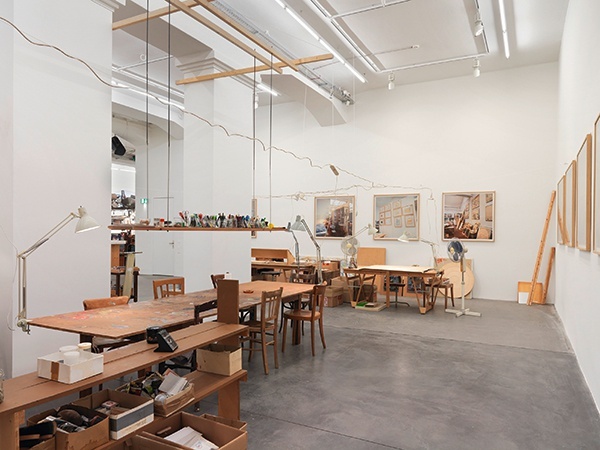 “Roth Bar” (2004 – 2013) was first unveiled in the exhibition “Dieter Roth: Lest / Train” at Reykjavik Art Museum in 2005, before continuing on to “Dieter Roth, Martin Kippenberger” at Hauser & Wirth Coppermill and, most recently, the bar was installed as part of “Dieter Roth Björn Roth. Islands” (HangarBicocca, Milan, Italy, 2013). The bar has gradually evolved during this period, as for each exhibition site-specific materials have been incorporated into the installation. 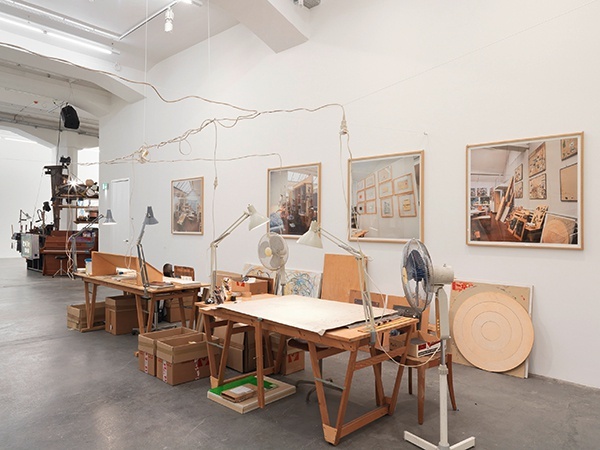 As both bar and studio were central concepts and locales for the work of Dieter Roth, the exhibition will also focus on “The Studio of Dieter and Björn Roth, Ackermannshof, Basel” (1995 – 2008). 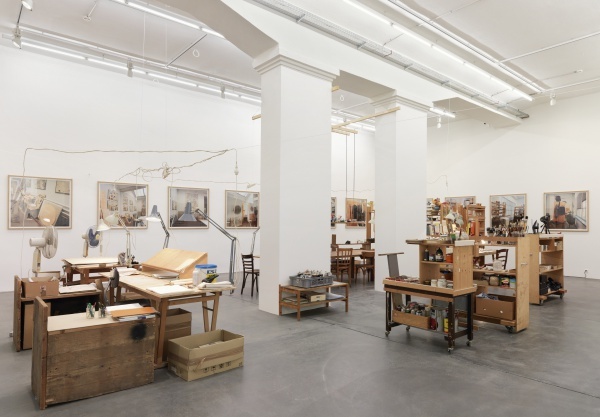 In this piece, Roth’s St. Johanns Vorstadt studio in Basel becomes a site of intervention—following his father’s death, his long-time collaborator and son, Björn, decided to preserve the space where they worked together from 1995. Upon leaving the locale, he kept every single object—including furniture, books, pens as well as personal items—as part of the installation. Through art, objects and atmosphere, the studio transmits the energy of his father and becomes an active cosmos again. Recapturing the spirit of Dieter Roth, the visitor is invited to become part of the artist’s on-going installation. Björn Roth recalls, “I don’t think the word ‘art’” was ever used. The studio was inventory, and the works were material. 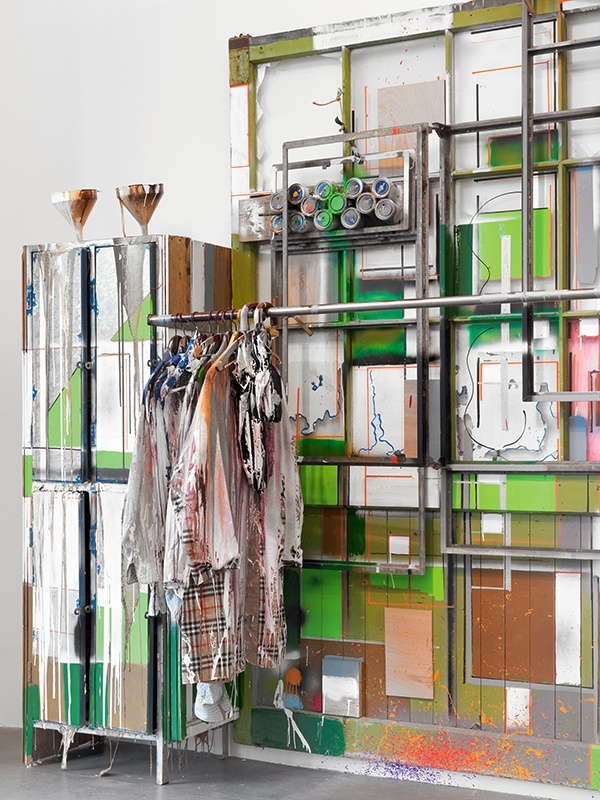 ‘Now we have to root around in the inventory’, he’d say when the time had come to work on something from our studios.’ “Roth Bar” is emblematic of this creative process as it includes items from Dieter Roth’s studio in Iceland, thus also activating the continuous re-use of materials. The bar and studio, thus, form two contrasting poles in this exhibition. Whereas “Roth Bar” is a site for lively interaction, bringing together audience and collaborators alike for music and performance, “The Studio of Dieter and Björn Roth, Ackermannshof, Basel” is a place of retreat and contemplation. “Roth Bar” will be presented alongside a series of ten gestural paintings by Björn Roth inspired by an ornithology book. These bird book paintings mix fine abstract marks with more translucent washes in oil paint; some also feature more intricately layered textures and colours. 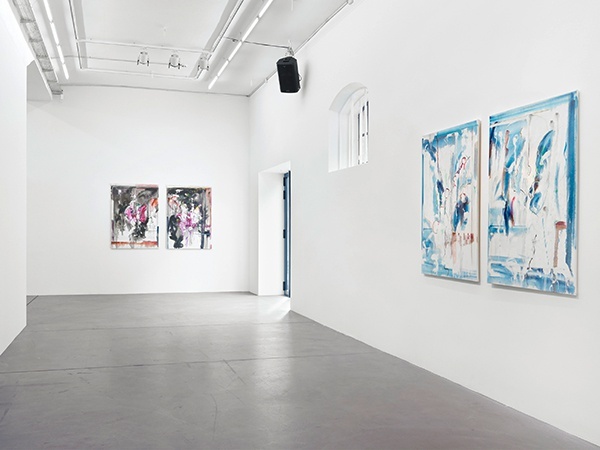 Shown together these artworks highlight the artistic legacy of Dieter Roth— as it lives on in the continued evolution of his collaborative pieces, and also in the creative practice of his son and grandson. 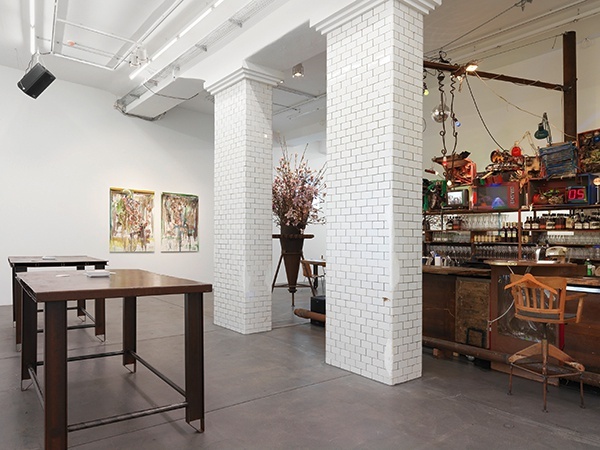 Recently, Björn and Oddur Roth have continued the bar building practice, creating “Roth New York Bar” for Hauser & Wirth New York’s inaugural exhibition at its 18th Street space in 2013, as well as “Roth Bar & Grill”, constructed for the unveiling of Hauser & Wirth Somerset in 2014. 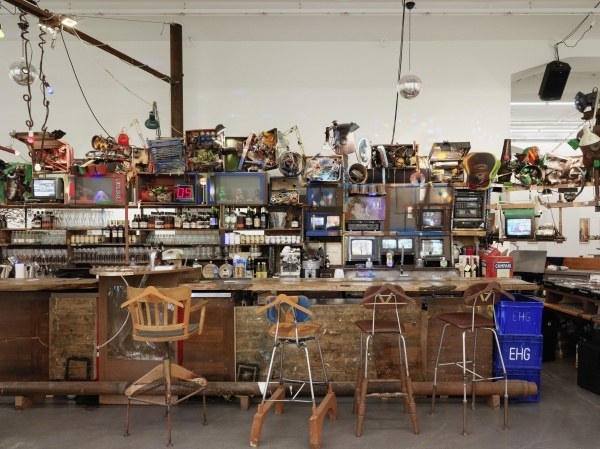 The assemblage-like bars always include locally-sourced, salvaged materials and often incorporate monitors showing videos, musical instruments and carpentry scraps. “Roth Bar” and its changing shape and configuration represent a continuously evolving practice, bridging the gap between art and life. Along with serving coffee and drinks and hosting DJs, the bar—run by Mr Samigo and Family—will further disrupt the juncture between artwork and reality by delivering a programme that includes live music, film screenings, a panel discussion, as well as a karaoke night and a slam poetry contest. © Dieter Roth Estate. Courtesy Hauser & Wirth, Zürich.